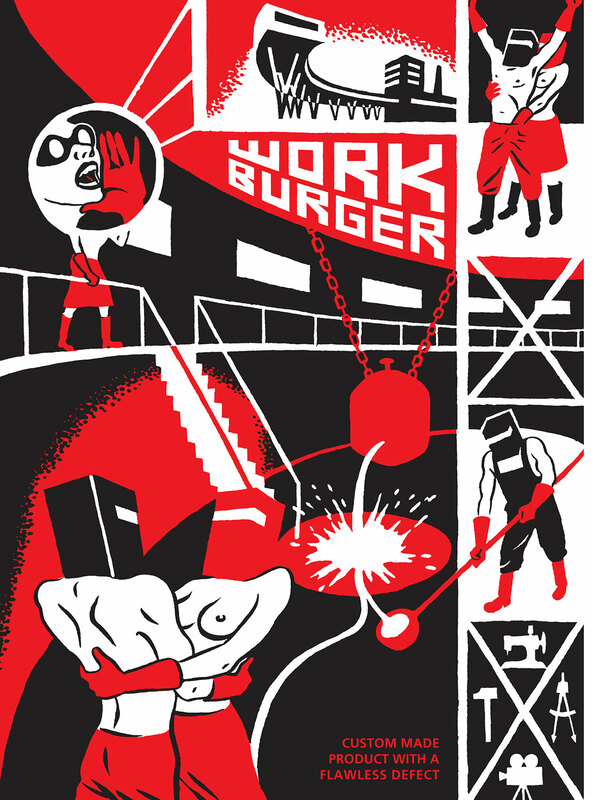 The Workburger International Comics Anthology features some of the finest masterworks of world-renowned artisans and craftsmen/craftswomen of the comics medium. This skillfully woven patchwork of diverse comic strip narratives, revolving around the topic of contemporary work, has been manually assembled from many serious and witty as well as provocative and investigative artistic takes on the topic. Contributing artists, drawing from both theory and personal experience, have tackled this elusive term, bridled its creative momentum and harnessed its vast, explosive potential: one of work’s most useful and at the same time dangerous characteristics. The book, lucidly detecting and generously displaying the various permutations in the meaning of the term itself, is thusly a document of its own time while still remaining a future classic by dint of covering one of the most universal human issues from time immemorial. Stripburger Enterprises proudly present some 50 working class heroes, who dedicate their thoughts, views, comics, blood, sweat and tears to the concept of work. Max Andersson (Sweden, Germany), Arkadi (Germany), Kaja Avberšek (Slovenia), Malin Biller (Sweden), Bruno Borges (Portugal), Paul Ashley Brown (UK), Teresa Camara Pestana (Portugal), Anna Ehrlemark (Sweden), Mattias Elftorp (Sweden), Domen Finžgar (Slovenia), Matti Hagelberg (Finland), Jyrki Heikkinen (Finland), Eva Hilhorst (Germany), Hurk (UK), Jeroen Janssen (Belgium), Kapreles (Belgium), Matej Kocjan – Koco (Slovenia), Tanja Komadina (Slovenia), Janek Koza (Poland), Peter Kuper (USA), Olaf Ladousse (Belgium, Spain), Capucine Latrasse (France), Matej Lavrenčič (Slovenia), Vincent Lefèbvre (France), Paul O’Connell & Lawrence Elwick (UK), Akinori Oishi (Japan),Emelie Östergren (Sweden), Alex Potts (UK), Tomáš Přidal (Czech Republic), Léo Quievreux (France), Martin Romero (Spain), Marcel Ruijters (The Netherlands), Tobias Schalken (The Netherlands), Lars Sjunnesson (Sweden, Germany), Mateusz Skudnik & Szymon Holcman (Poland), Boris Stanić (Serbia), Andrej Štular (Slovenia), Kondor Tamás (Hungary), Yann Trehin (France), Katherine Verhoeven (Canada), Estêvão Vieira (Brazil), Lasse Wandschneider (Germany), Daniel Žeželj (Croatia, USA). With an introduction by Bojan Albahari (Slovenia), cover art by Igor Hofbauer (Croatia), inside cover art by Daniel Bueno (Brazil) and illustrations by Miguel Carneiro (Portugal). Our work here is done. Now it’s your turn, dear reader! Warning: When you finish this book, you will never again regard work in the same light as before.